The research group Micromechanics of Large Deformations aims at using the micromechanical modelling approach to describe large deformations of materials or components at the macroscopic scale. To achieve this goal, we focus on three research areas including: microstructure digitalisation; crystal plasticity models and parameterisation technique; and in-depth analysis of microstructure deformation. Firstly, the method for digitalising microstructures is of crucial importance, because it must be able to capture important microstructural features such as: grain size and shape distribution; texture; misorientation distribution etc. Hence, various platforms to generate microstructure models have been explored within our group. Our aim is to provide an industrial solution to digitalize microstructure, which are available for existing materials or microstructure design. Digitalisation of a microstructure which starts from microstructure characterisation. The process starts from microstructure characterisation using EBSD. 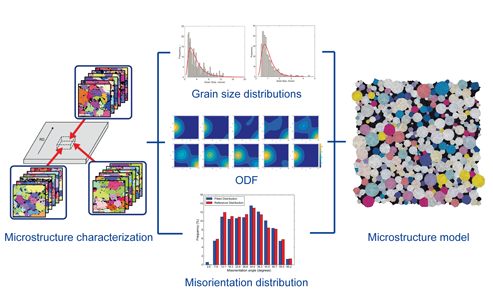 Results are then quantitatively characterised to obtain grain size distribution of each constituents, Orientation Distribution Function (ODF), and misorientation distribution. The method currently under development aims to generate microstructure models, which quantitatively mimic these microstructural features. As new materials with more complex microstructures are constantly being developed, more advanced models are hence required to describe complex deformation mechanisms. Thus, we continuously intensify our expertise in crystal plasticity to consider multi-deformation mechanisms such as slip, phase transformations, and diffusional creep. In addition, inverse methods to parameterise material model are also within the scope of our work. The combination of digitalised microstructure and material modelling allows us to investigate the dependence of deformation mechanism on microstructural features. 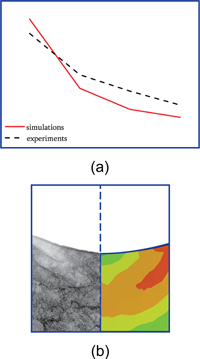 Based on the microstructure simulations, we predict macroscopic properties using homogenisation techniques, study the texture evolution during deformation, and change in other microstructural features. 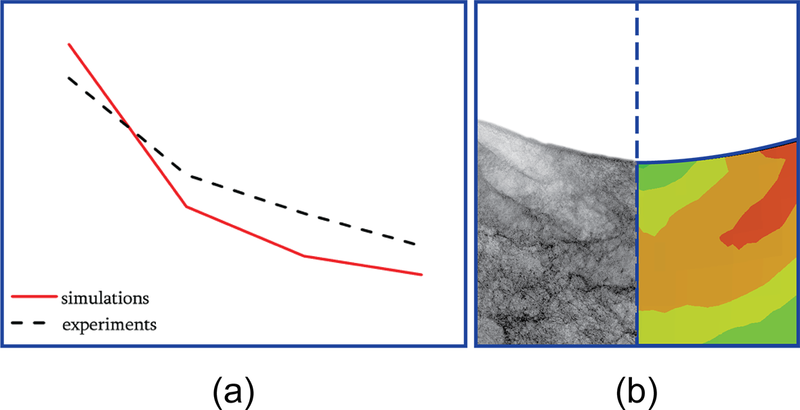 Analysis of Indentation Size Effect (ISE) in spherical nanoindentation by experiment and non-local crystal plasticity. In this work, ISE can be observed in the parameterized nanoindentation models which are also in a good agreement with experimental results (a). By analyzing residual imprints from both experiments and simulations, one can better understand the mutual contributions of geometrically necessary dislocations (GND) and statistically stored dislocations (SSD) to the material response (b).